Enjoying a fantastic location moments from Kensington Gardens and the vibrant shops and eateries lining Notting Hill Gate, this well presented studio flat features a separate kitchen and a modern shower room. Clanricarde Gardens is a residential cul-de-sac opposite Kensington Gardens, moments from the fashionable shops, bars and restaurants of Notting Hill Gate. 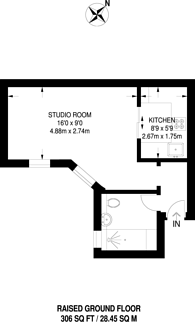 306 (28 Sq M) approx.